Can you believe JAWS will be shut down forever in less than a month? Universal Orlando's "One Final Escape" mailer - front. 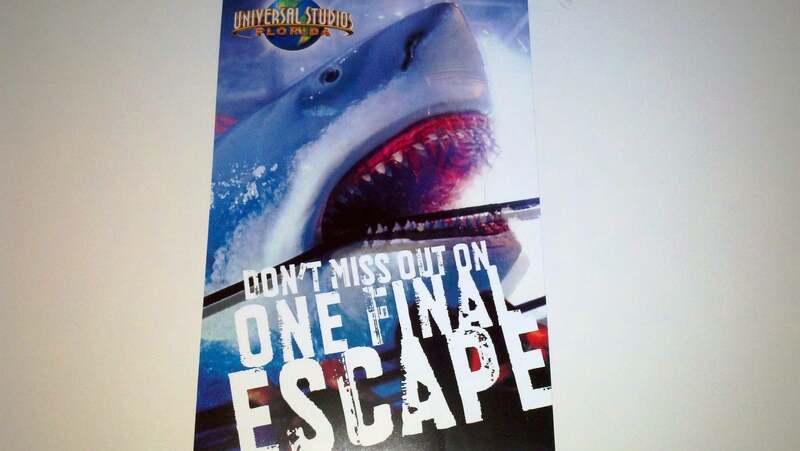 Universal Orlando's "One Final Escape" mailer - back. JAWS at Universal Studios Florida. Officials at Universal Orlando announced Friday they’re planning to close the “Jaws” attraction. The ride was one of the original attractions at Universal Studios and will be closed permanently at 9 p.m. on Jan. 2, 2012, as well as the Amity area. 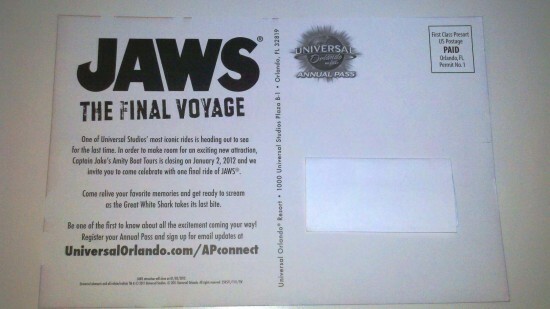 Hey fans, we want you to be the first to know… JAWS! and the Amity area will officially close on January 2 to make room for an exciting, NEW, experience we’re planning for you. We know you love JAWS! and we do too. 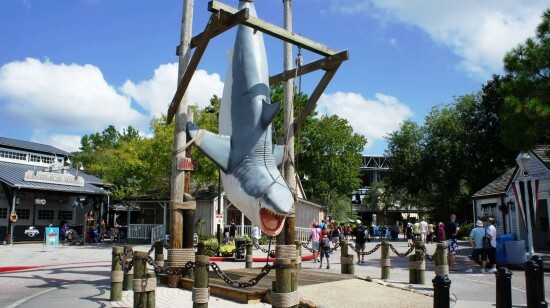 It has been an amazing attraction and after terrorizing the waters of Amity here at Universal Orlando for 20 years, it’s a VERY important part of our history. So, we’ve got a couple things planned to ensure we always remember and honor it. We know it’s hard to say goodbye, but we can’t express how EXCITED we are about the new, innovative & amazing experience we’re going to be bringing you. That is a huge area of the park that will be shut down. One can only wonder what will takes its place. Transformers? OI subscribers, I have already updated the OI Universal Orlando Center’s JAWS page and the OI Priority List for USF with this information. Has Midway grill moved anywhere else in the park? it’s where we always stopped for hotdogs . Unfortunately, Midway Grill was closed down with the rest of Amity. WOW. Very sad news. Glad we got to see it one more time last summer. Going to be there the weekend of Dec. 18. We’ll enjoy it at least one more time. Looking forward to hearing what will replace it. Sounds as if it going to be something special.